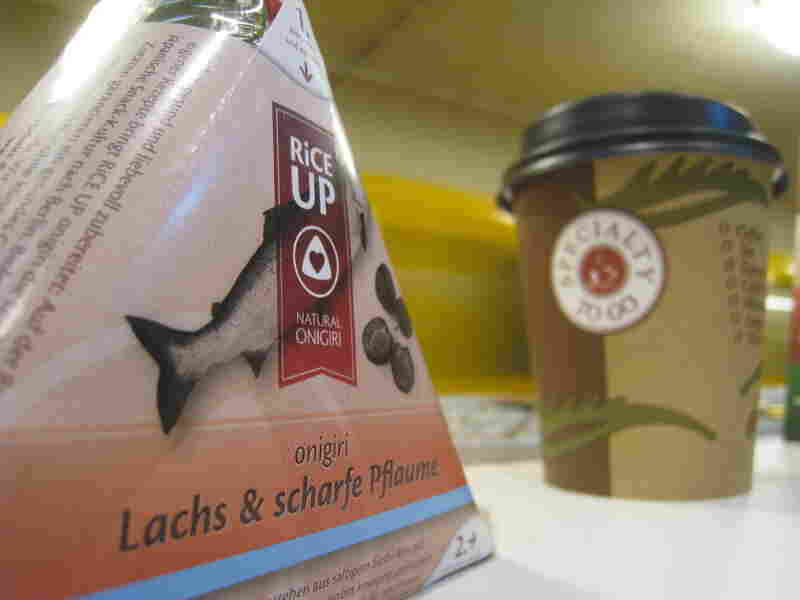 Berlin's 'Rice Up,' Healthy Fast Food With A European Touch Directly on the U-Bahn platform of Schoenleinstrasse, Rice Up serves a selection of Onigiri, based on the traditional Japanese fillings. Some Berliners are calling the "healthy fast food" option the best grab and go snack in the city. Rice Up is located on the station platform of U-Bahn Schoenleinstrasse. Directly on the platform of the U-Bahn station Schoenleinstrasse, a young woman is buying a Japanese snack. What used to be a news stand at the station is now Rice Up, a take-away sandwich shop. Thorsten Reuter and his partner, Arev, opened Rice Up a couple months ago. Their selection of Onigiri is based on traditional Japanese fillings, but they do make one exception: offering a Mediterranean option. An Onigiri filled with Ratatouille and feta cheese. Reueter say he came up with the idea for Rice Up a decade ago when he was in Japan. "My business partner, Arev, 10 years back, he was the first time in Japan filming, and I was in Japan and Korea 11 years ago, and we discovered Onigiri. You can get it everywhere. It's healthy, it's yummy. Sometimes you don't know what's inside because you can't read the signs, but that's when we thought, 'Wow, this has potential,'" Reueter says. Reueter feels Rice Up has caught on with Berliners in part because of their European touch. "Some people- they come especially for this. We have the Shiitake mushroom, and then we have the Onigiri of the week. It's traditional Japanese plum, it's very spicy, very salty, and very sour. The mixture is just fantastic." Customer Zohaib Zafar says he thinks Rice Up is the best grab and go snack in the city. "When I saw it for the first time, I thought it wouldn't be very easy actually because I thought the rice would break, and it really surprised me." Zafar, who refers to his home country of Pakistan as the food nation, is excited about the Japanese snack, known as Onigiri: a traditional white rice ball formed into a triangular shape wrapped in seaweed and filled with either fish, beef, or vegetables. It's pre-packaged for those on the go. Rice Up is still a very small business. Thorsten Reuter says they produce between 150 and 200 Onigiri's a day. They've employed a German cook who was working as a sushi chef in Hawaii. All the products they use are organic. "We want to introduce things as they are. You have to feel what you eat. You have to sense it. That's what we are not used to anymore, at least that's what I believe. That's why we take care of what we produce. We don't want to put cheap stuff into it." Reuter is looking to expand Rice Up. He only needs a few square meters to sell, what he calls "healthy fast food." So in the future, the Asian street cuisine might pop up at outdoor markets and in shelves of whole-food stores across Berlin.